Flygon (DRM 39) flies into the meta from the Dragon Majesty expansion set. This Stage 2 Dragon Pokemon has an ability and an attack. Dragon Guard prevents all effects of your opponent’s attacks, except damage, done to your Dragon Pokémon. Its attack, Sand Tomb, costs three energy attachments (2 Fighting and a Colorless), does 110 damage, and prohibits your opponent’s active Pokemon from retreating during the following turn. If you caught my statistical analysis on attacks done since the beginning of the new Standard format, you’ll know that attacks carried special conditions only a little more than 5% of all attacks carried an effect that included a special condition. Moreover, Flygon is a Stage 2, so it’s going to take it at least a couple of turns to get into play… and when it does, it doesn’t remove any existing special conditions either. And again if you read my article, you know that 110 damage is pretty mediocre in today’s meta. To frame 110 damage, look at it like this: 334 of the 1,004 attacks I recorded (33%) did more than 110 damage to the active Pokemon. Sorry Flygon, maybe if special conditions become more prevalent in the meta, but considering you only help out only Dragon Pokemon as well, this card lives in a small niche carved out from a small niche. Flygon (Dragon Majesty 39/70) has an Ability that protects your [N] Pokémon from the effects of attacks, other than damage. Now… how many of the current, top decks rely on the effects they place upon the other player’s Pokémon through attacking? Not many, and that even includes the more pedestrian stuff like Special Conditions. It hasn’t been that long since such a thing was Standard relevant: Greninja BREAK decks, or rather the “Shadow Stitching” attack from Greninja (XY – BREAKpoint 40/122) readily spring to mind, especially as it was a deck that waxed and waned in efficacy but never entirely went away after introduction. The thing is, even if we had a metagame full of such decks, Flygon only protects [N] Pokémon and is a Stage2. The only reason it is remotely plausible is that the [N] Typing has access to two potential shortcuts, Lance [Prism Star] and the “Dragon Porter-GX” attack of Dragonite-GX. Even though some (including myself) were quite excited about these cards prior to their release, since then they haven’t shown up in any top cuts for recent, large-scale events… and while that might seem reasonable when you have 788 Masters Division players like at the recent Memphis, TN Regional Championship, the top cut I’m talking about was 77 players, so just under the top 10%. Even I have to admit I got the relevance of the new [N] support wrong, at least in the short term. …which is a problem because the Ability isn’t something to build a deck around, and when you’re a Stage 2, you need to be worth building a deck around or have another, proven, in for competitive play. Flygon only has unproven (or proven to be inadequate) shortcuts meant for decks that have yet to materialize. None of the older Flygon are currently worth the effort in Expanded. There is more competition for deck space in the few decks where you could force it in, but there are several nasty non-damage effects found in competitive decks in this Format. Remember, it is treated as a non-damage effect when an attack directly places damage counters on something. Still, for both Constructed Formats, we’re left hoping for a new Flygon or Flygon-GX that proves worth the hassle. I don’t know if you’re really able to use Dragon Majesty packs for Limited Format play, but if you do and you can pull this entire Evolution line, it looks like a solid deal. Plus, the set is heavily skewed towards [N] Types. Flygon is a Stage 2 Dragon Pokemon, 140 HP, with a Fairy Weakness, no Resistance, and a Retreat Cost of 1. 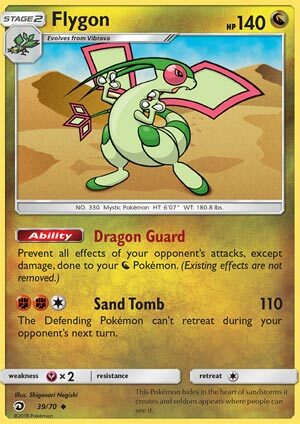 Dragon Guard prevents all effects of attacks that aren’t damage done to your Dragon Pokemon, while Sand Tomb is a 3-for-110 that prevents the opposing Pokemon from retreating. Needless to say, you’re running him for Dragon Guard, which gives a pretty wide range of protection. The main problems though are that you’re working around Flygon’s Stage 2 in order to get protection for your Dragons, which need to be in a deck that runs Stage 2 stuff alongside the normal stuff. Overall, deck space might just be too tight to fit him in. Flygon: he tries very hard. Arora Notealus: Flygon’s purpose is clear, just difficult to get out with all the moving parts in play. If you can get him out, though, you probably ought to win – outside of any Supporters or Items your opponent might use though. Next Time: An older way of fighting that was powerful.